To form the Regiment or Battalion. 297 At the signal, called the adjutant's call, the companies are marched from their company parades by their captains, the music playing. The color company serves as the basis of the formation, and is the first to form; the color-guard being at the point where the centre of the line is to rest, one marker is placed in front of it, his elbow touching the right corporal of the color-guard, and another on the line at a little less than company distance from him, on his right and facing towards him; the color company is halted three paces behind this line, faced to the front, and dressed up upon the line by the captain, who aligns it to the left. The company on the left of the color is the next to take its post; it is halted three paces behind the line, its right nearly behind the left file of the color-guard, and faced to the front; as soon as it halts the left guide of the company throws himself out, so as to be opposite one of the three left files of the company, faces to the right, and aligns himself upon the two markers; the captain then places himself on the left of the color guard, on a line with its fromt rank, and aligns the company to the right. The company on the right of the colors forms next upon the same principles; the right guide posts himself upon the line opposite one of the three right files of the company, and faces to the left; the captain places himself on the right of the color company, and aligns his company to the left. their places by passing through the intervals between the companies, and those captains who are on the left of their companies, shift to the right. To open and to close ranks. 1. Prepare to open ranks. At this command, the lieutenant-colonel and major will place themselves on the right of the battalion, the first on the flank of the file closers, and the second four paces from the front rank of the battalion. 2. To the rear, open order. 3. MARCH. At the second command, the covering ser­geants, and the sergeant on the left of the battalion, will place themselves four paces in rear of the front rank, and opposite their places in line of battle, in order to mark the new alignment of the rear rank; they will be aligned by the major on the left sergeant of the battalion, who will be careful to place himself exactly four paces in rear of the front rank, and to hold his piece between the eyes, erect and inverted, the better to indicate to the major the direction to be given to the covering sergeants. At the command march, the rear rank and the file closers will step to the rear without count­ing steps; the men will pass a little in rear of the line traced for this rank, halt, and dress forward on the covering sergeants, who will align correctly the men of their respective companies. 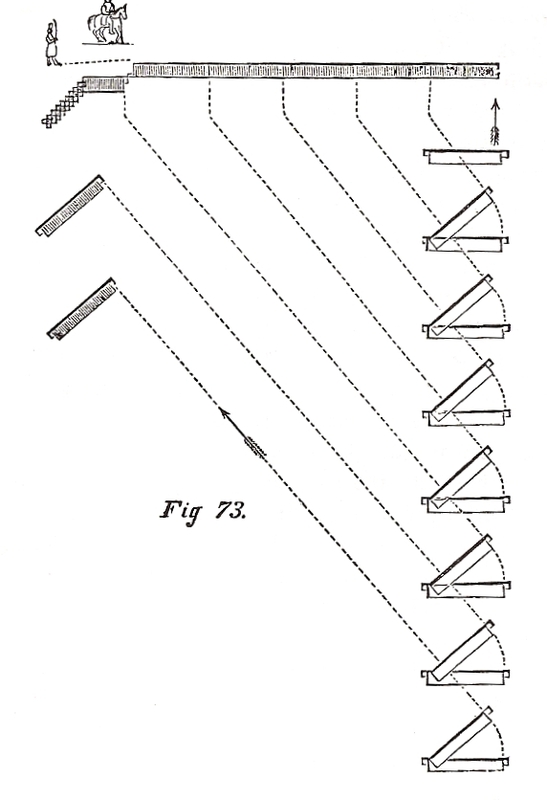 The file closers will fall back and preserve the distance of two paces from the rear rank, glancing eyes to the right; the lieutenant colonel will, from the right, align them on the file closer of the left, who, having placed himself accurately two paces from the rear rank, will invert his piece, and hold it up erect between his eyes, the better to be seen by the lieutenant colonel. At this command, the lieutenant colonel, major, and the left sergeant, will retake their places in line of battle. The colonel will cause the ranks to be closed by the commands prescribed for the instructor in the school of the company. 299. The colonel will cause to be executed the fire by company, the fire by wing, the fire by bat­talion, the fire by file, and the fire by rank, by the commands to be herein indicated. The fire by company and the fire by file will always be direct; the fire by battalion, the fire by wing, and the fire by rank, may be either direct or oblique. When the fire ought to be oblique, the colonel will give, at every round, the caution right (or left) oblique, between the commands ready and aim. The fire by company will be executed alternately by the right and left companies of each division, as if the division were alone. The right company will fire first; the captain of the left will not give his first command till he shall see one or two pieces at a ready in the right company; the captain of the latter, after the first discharge, will observe the same rule in respect to the left com­pany; and the fire will thus be continude alternately. The colonel will observe the same rule in the firing by wing. The fire by file will commence in all the companies at once, and will be executed as has been prescribed in the school of the company No 55 and following. The fire by rank will be executed by each rank alternately, as has been prescribed-in the school of the company. The fire by rank will be executed by each rank alternately. The color-guard will not fire, but reserve itself for the defence of the color. 1. Fire by company. 2. Commence firing. At the first command, the captains and covering sergeants will take the positions indicated in the school of the company. The color and its guard will step back at the same time, so as to bring the front rank of the guard in a line with the rear rank of the battalion. This rule is general for all the different firings. At the second command, the odd numbered companies will commence to fire; their captains will each give the commands prescribed in the school of the company No. 50, observing to precede the command company by that of first, third, fifth, or seventh, according to the number of each. The captains of the even numbered compa­nies will give, in their turn, the same commands, observing to precede them by the number of their respective companies. In order that the odd numbered companies may not all fire at once, their captains will ob­serve, but only for the first discharge, to give the command fire one after another; thus, the captain of the third company will not give the command fire until be has heard the fire of the first com­pany; the captain of the fifth will observe the same rule with respect to the third, and the cap­tain of the seventh the same rule with respect to the fifth. The colonel will cause the fire to cease by the sound to cease firing; at this sound, the men will execute what is prescribed in the school of the company No. 63; at the sound, for officers to take their places after firing, the captains, covering sergeants, and color-guard, will promptly resume their places in line of battle: this rule is general for all the firings. 1. Fire by wing. 2. Right wing. 3. READY. 4. Aim. 5. FIRE. 6. LOAD. recommence the fire by the commands: 1. Right wing; 2. Aim; 3. FIRE; 4. LOAD. 1. Left wing; 2. Aim; 3. FIRE; 4. LOAD; in conforming to what is prescribed No. 35. The colonel will cause this fire to be executed by the commands last prescribed, substituting for the first two, 1. Fire by battalion; 2. Battalion. 1. Fire by rank. 2. Battalion. 3. READY. 4. Commence firing. At the fourth command, the fire will commence on the right of each company, as prescribed in the school of the company No. 57. The colonel may, if he thinks proper, cause the fire to com­mence on the right of each platoon. 1.Fire by rank. 2. Battalion. 3. READY. 4. Rear rank. 5. AIM. 6. FIRE. 7. LOAD. This fire will be executed as has been ex­plained in the school of the company No. 59, in following the progression prescribed for the two ranks which should fire alternately. place in the front rank; the lieutenant colonel, adjutant, major, sergeant major, and the music will place themselves before the front rank, and face to the rear, each opposite his place in the line of battle, the first two passing around the right, and the others around the left of the battalion. At the third command, the battalion will face about; the captains and covering sergeants observing what is prescribed in the School of the company No. 230. The battalion facing thus by the rear rank, the colonel will cause it to execute the different fires by the same commands as if it were faced by the front rank. 1. Face by the front rank. 2. Battalion. 3. About-FACE. Different modes of passing from the order in battle to the order in column. To break to the right or the left into column. 300. Lines of battle will habitually break into column by company; they may also break by division or by platoon. 1.By company, right wheel. 2. MARCH (or double quick-MARCH). 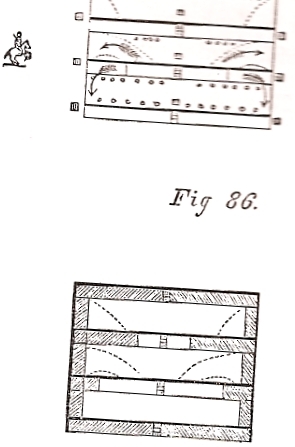 Fig 63. At the first command, each captain will place himself rapidly before the centre of his com­pany, and caution it that it has to wheel to the rig ht; each covering sergeant will replace his captain in the front rank. 1. Such company. 2. HALT. At the second command, which will be given at the instant the left guide shall be at the distance of three paces from the perpendicular, the company will halt; the guide will advance and place his left arm lightly against the breast of the captain, who will establish him on the alignment of the man who has faced to the right; the cover­ing sergeant will place himself correctly on the alignment on the right of that man; which being executed, the captain will align his company by the left, command FRONT, and place himself two paces before its centre. The captains having commanded FRONT, the guides, although some of them may not be in the direction of the preceding guides, will stand fast, in order that the error of a company that has wheeled too much or too little may not be propa­gated; the guides not in the direction will readily come into it when the column is put in march. A battalion in line of battle will break into column by company to the left, according to the same principles; anti by inverse means. When the battalion breaks by division, the indication division will be substituted in the com­mands for that of company; the chief of each divi­sion (the senior captain) will conform himself to what is prescribed for the chief of company, and will place himself two paces before the centre of his division; the junior captain, if not already there, will place himself in the interval between the two companies in the front rank, and be covered by the covering sergeant of the left com­pany in the rear rank. The right guide of the right company will be the right guide, and the left guide of the left company, the left guide of the division. 3. Forward. 4. MARCH. 5. Guide left. To break to the rear, by the right or left, into column. 1. By the right of companies to the rear into column. 2. Battalion right-FACE. 3. MARCH (or double quick-MARCH). (Fig. 64) At the first command, each captain will place himself before the centre of his company, and caution it to face to the right; the covering ser­geants will step into the front rank. At the second command, the battalion will face to the right ; each captain will hasten to the right of his company, and break two files to the rear; the first will break the whole depth of the two ranks; the second file less; which being executed, the captain will place himself so that his breast may touch lightly the left arm of the front rank man of the last file in the company next on the right of his own. The captain of the right company will place himself as if there were a company on his right, and will align himself on the other captains. The covering sergeant of each company will break to the rear with the right files, and place himself before the front rank of the first file, to conduct him. 1. Such company. 2. HALT. 3. FRONT. 4. Left--DRESS. At the instant the company faces to the front, its left guide will place himself so that his left arm may touch lightly the breast of his captain. guide, the captain so directing it, that the new alignment may be perpendicular to that which the company had occupied line of battle, and, the better to judge this, he will step back two paces from the flank. The company being aligned, the captain will command: FRONT, and take his place before its centre. 1.By the right of companies to the rear into column. 2. Battalion, by the right flank. 3.MARCH (or double quick-MARCH). At the first command, each captain will step briskly in front of the centre of his company, and caution it to face by the right flank. 3. Battalion, by the left flank-MARCH. 4. Guide-left. To break to the rear by the left, the colonel will give the same commands as in the case of breaking to the rear by the right, substituting the indication left, for that of right. The battalion may be broken by division to the rear, by the right or left, in like manner. To ploy the battalion into close column. This movement may be executed by company or by division, on the right or left subdivi­sion, or on any other subdivision, right or left in front. 1.Close column, by division. 2. On the first division, right in front. 3. Battalion, right-FACE. 4.MARCH (or double quick-MARCH). will remind them that they will have to face to the right, and the covering sergeant of the right company of each division will replace his captain in the front rank, as soon as the latter steps out. At the third command, the last three divisions will face to the right; the chief of each division will hasten to its right, and cause files to be broken to the rear, as indicated No. 89; the right guide will break at the same time, and place himself before the front rank man of the first file, to conduct him, and each chief of division will place himself by the side of this guide. in each will place himself on the left of the covering sergeant of the left company, who will place himself in the front rank. This rule is general for all the ployments by division. At the command march, the chief of the first division will add, guide left; at this, its left guide will place himself on its left, as soon as the movement of the second division may permit, and the file closers will advance one pace upon the rear rank. 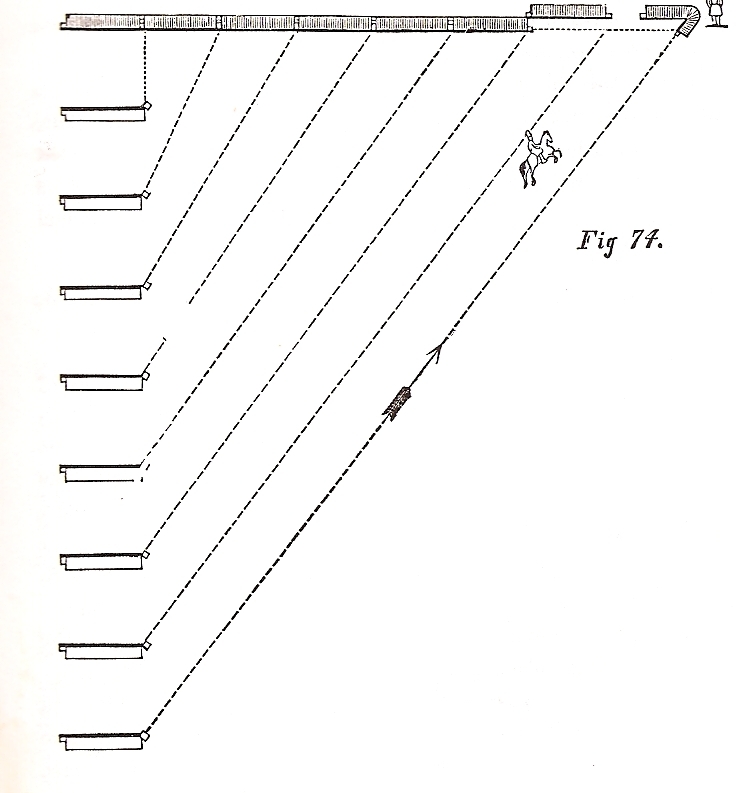 All the other divisions, each conducted by its chief, will step off together, to take their places in the column; the second will gain, in wheeling by file to the rear, the space of six paces, which ought to separate its guide from the guide of the first division, and so direct its march as to enter the column on a line parallel to this division; the third and fourth divisions will direct themselves diagonally towards, but a little in rear of, the points at which they ought, respectively, to enter the column; at six paces from the left flank of the column, the head of each of these divisions will incline a little to the left, in order to enter the column as has just been prescribed for the second, taking care also to leave the distance of six paces between its guide and the guide of the preceding division. At the moment the divisions put them­selves in march to enter the column, the file closers of each will incline to the left, so as to bring themselves to the distance of a pace from the rear rank. 1. Such division; 2. HALT; 3. FRONT. 4. Left-DRESS. At the second command, the division will halt; the left guide will place himself promptly on the direction, six paces from the guide which precedes him, in order that, the column being formed, the divisions may be separated the dis­tance of four paces. he will command, FRONT and place himself before the centre of his division. The lieutenant-colonel, placing himself in succession in rear of the left guides, will assure them on the direction as they arrive, and then move to his place outside of the- left flank of the column six paces from, and abreast with, the first division. In assuring the guides on the direction, he will be a mere observer, unless one or more should fail to cover exactly the guide or guides already established. This rule is general. At the second and third commands, the chiefs of divisions and the junior captains will conform themselves to what has been prescibed above; but the chiefs of the last three divisions, instead of causing the first two files to break to the rear, will cause them to break to the front. At the fourth command, the chief of the first division will add: Guide Right. The three other divisions will step off together to take their places in the column in front of the directing division; each will enter in such manner that, when halted, its guide may find hinself six paces from the guide of the division next previously established in the column. Each chief of these divisions will conduct his division, till his right guide shall be nearly up with the guide of the directing one; he will then halt his division, and cause it to face to the front; at the instant it halts, its right guide will then face to the rear, place himself six paces from the preceding guide, and cover him exactly--which being done, the chief will align his division by the right. The lieutenant-colonel, placed in front of the right guide, of the first division, will assure the guides of the direction as they successively arrive. I. Close column by division. 2. On the fourth di­vision, left (or right) in front. 3. Battalion, left - FACE. 4. MARCH (or double quick -MARCH). These movements will be executed according to the principles of those which precede, but by inverse means: the fourth division on which the battalion ploys will stand fast; the instant the movement commences, its chief will command, guide, right (or left). 1. Close column by division. 2. On such division, right (or left) in front. 3. Battalion, inwards-FACE. 4. MARCH (or double quick-MARCH). 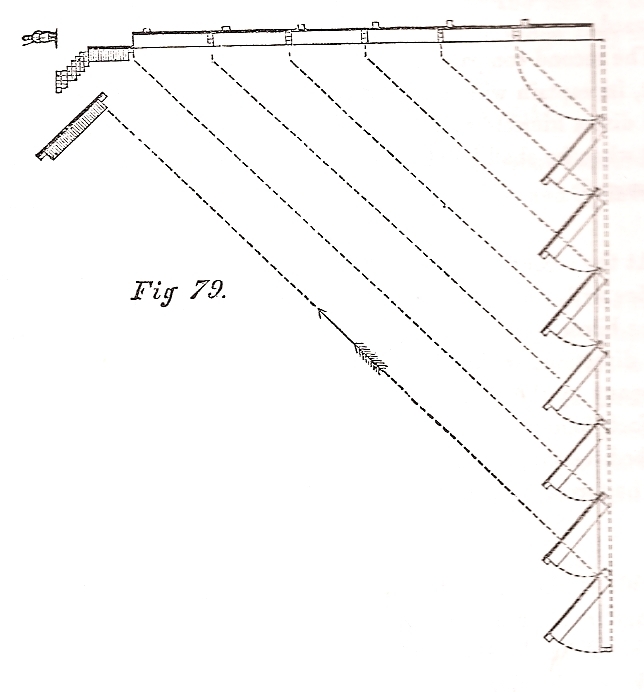 (Fig 67.) The instant the movement commences, the chief of the directing division will command, guide- left (or right). The divisions which, in the order in battle, are to the right of the directing division, will face to the left; those which are to the left, will face to the right. To march in column at full distance. 306. When the colonel shall wish to put the column in march, he will indicate to the leading guide two distinct objects in front, on the line which the guide ought to follow. This guide will immediately put his shoulders in a square with that line, take the more distant object as the point of direction, and the nearer one as the intermediate point. 1. Column, forward. 2. Guide left (or right.)3. MARCH (or double quick-MARCH). At the command march, briskly repeated by the chiefs of subdivision, the column will put itself in march, conforming to what is prescribed in the school of the company, No. 244. The leading guide may always maintain himself correctly on the direction by keeping steadily in view the two points indicated to him, or chosen by himself; if these points have a certain elevation, he may be assured he is on the true direction, when the nearer masks the more distant point. The following guides will preserve with exactness both step and distance; each will march in the trace of the guide who immediately precedes him, without occupying himself with the general direction. The lieutenant-colonel will hold himself, habitually, abreast with the leading guide, to see that he does not deviate from the direction, and will observe, also, that the next guide marches exactly in the trace of the first. The major will generally be abreast with the last subdivision; he will see that each guide marches exactly in the trace of the one immediately preceding; if either deviate from the direction, the major will promptly rectify the error, and prevent its becoming propagated; but he need not interfere, in this way, unless the deviation has become sensible, or material. To change direction in column at full distance. Head of column to the left (or right). his subdivision to change direction by the commands and according to the principles prescribed in the school of the company. When the wheel is completed, the chief of this subdivision will retake the guide, if changed, on the side of the primitive direction. The chief of each succeeding subdivision, as well as the guides, will conform to what has just been explained for the leading subdivision. When the column is at half distance the pivot man will takea pace of fourteen inches instead of nine. 1. Battalion, right about. 2. MARCH. 3. Guide right. At the second command, the companies will face to the right about, and the column will then march forward in an opposite direction; the chiefs of subdivision will remain behind the front rank, the file closers in front of the rear rank, and the guides will place themselves in the same rank. column will halt; no guide will stir, though he may have lost his distance, or be out of the direction of the preceding guides. The column being in march, in double quick time, will be halted by the same commands. At the command halt the men will halt in their places, and will themselves rectify their positions in the ranks. The column being halted, when the colonel shall wish to form it into line of battle, he will move a little in front of the leading guide, and face to him; this guide and the following one will fix their eyes on the colonel, in order promptly to conform themselves to his directions. If the colonel judge it not necessary to give a general direction to the guides, he will limit himself to rectifying the position of such as may be without, or within the direction, by the com­mand guide of (such) company, or guides of (such) companies, to the right, (or to the left;) at this command, the guides designated will place themselves on the direction; the others will stand fast. To close the column to half distance, or in mass. At the first command, the captain of the leading company will caution it to stand fast. At the command march, which will be repeated by all the captains, except the captain of the leading company, this company will stand fast, and its chief will align it by the left; the file closers will close one pace upon the rear rank. All the other companies will continue to march, and as each in succession arrives at platoon distance from the one which precedes, its captain will halt it. At the instant that each company halts, its guide will place himself on the direction of the guides who precede, and the captain will align the company by the left; the file closers will close one pace upon the rear rank. No particular attention need be given to the general direction of the guides before they respectively halt; it will suffice if each follow in the trace of the one who precedes him. The colonel, on the side of the guides, will superintend the execution of the movement, ob­serving that the captains halt their companies ex­actly at platoon distance the one from the other. The lieutenant-colonel, a few paces in front, will face to the leading guide and assure the posi­tions of the following guides as they successively place themselves on the direction. The major will follow the movement abreast with the last guide. If the column be in march, the colonel will cause it to close by the same commands. If the column be marching in double quick time, at the first command, the captain of the leading company will command quick time; the chiefs of the other companies will caution them to con­tinue their march. At the command march, the leading company will march in quick, and the other companies in double quick time and as each arrives at platoon distance from the preceding one, its chief will cause it to march in quick time. When the colonel shall wish to halt the column and to cause it to close to half distance at the same time, he will notify the captain of the leading company of his intention, who at the com­mand march will halt his company and align it by the left. If the column be marching in quick time, and the colonel should not give the command double quick, the captain of the leading company will halt his company at the command march, and align it by the left. In the case, where the colonel adds the command double quick, the leading company will continue at quick, while all the others, at the command march, take double quick time. To close the column on the eighth, or rearmost company. 1. On the eighth company, to half distance close column. 2. Battalion about-FACE. 3. Column forward. 4. Guide right. 5. MARCH (or double quick-MARCH). At the second command, all the companies except the eighth, will face about, and their guides will remain in the front rank, now the rear. At the fourth command, all the captains will place themselves two paces outside of their companies on the directing flank. the front. At the moment that each company halts, the left guide, remaining faced to the rear, will place himself promptly on the direction of the guides already established. Immediately after, the captain will align his com­pany by the left, and the file closers will close one pace on the rear rank. At this command, the company designated will face to the right about and halt. All the companies being aligned, the colo­nel will cause the guides, who stand faced to the rear, to face about. The lieutenant-colonel, placing himself behind the rearmost guide, will assure successively the positions of the other guides, as prescribed No. 259; the major will remain abreast with the rearmost company. 1. On the eighth company, to half distance, close column. 2. Battalion right about. 3. MARCH (or double quick-MARCH-) 4. Guide right. At the first command, the captain of the eighth company will caution his company that it will remain faced to the front; the captains of the other companies will caution their companies that they will have to face about. At the command march, the captain of the eighth company will halt his company and align it by the left; the file closer's will close one pace upon the rear rank. The lieutenant-colonel will follow the movement abreast of the first company. The major will place himself a few paces in rear of the guide of the eighth company, and will assure successively the position of the other guides. 312. A column by division at full distance will close to half distance by the same means and the same commands. A column, by company, or by division, being at full or half distance, the colonel will cause it to close in mass by the same means and commands, substituting the indication, column, close in mass, for that of to half distance, close column. In a column, left in front, these various movements will be executed on the same princi­ples. Being in column at half distance, or closed in mass, to take distances. To take distances by the head of the column. By the head of column, take wheeling distance. 1.First company, forward. 2. Guide left. 3. MARCH (or double quick-MARCH). 1. Second company, forward. 2. Guide left 3. MARCH (or double quick-MARCH). other companies will successively execute what has just been prescribed for the second. The colonel will see that each company puts itself in march at the instant it has its distance. The lieutenant colonel will bold himself at the bead of the column, and direct the march of the leading guide. The major will hold himself abreast with the rearmost guide. If the column be marching in quick time, at the command march, the captain of the leading company will cause double quick time to be taken; which will also be done by the other captains as the companies successively attain their proper wheeling distance. If the column be marching in double quick time, the leading company will continue to march at the same gait. The captains of the other com­panies will cause quick time to be taken, and as each company gains its proper distance, its cap­tain will cause it to retake the double quick step. To take distances on the rear of the column. 1.On the eighth company, take wheeling distance. 2. Column forward. 3. Guide left. 4. MARCH. (or double quick-MARCH). paces outside of the direct­ing flank; the captain of the eighth company will caution it to stand fast. At the command march, repeated by all the captains, except the captain of the eighth com­pany, this latter company will stand fast; its chief will align it by the 1eft on the first marker, who is opposite to this company, and place himself before its centre, after commanding: FRONT. At this command, the marker will retire, and the left guide will take his place. All the other companies will put themselves in march, the guide of the leading one directing himself a little within the right general guide; when the seventh company has arrived opposite the second marker, its captain will halt, and align it on this marker, in the manner prescribed for the eighth company. When the captain of the sixth company shall see that there is between his company. 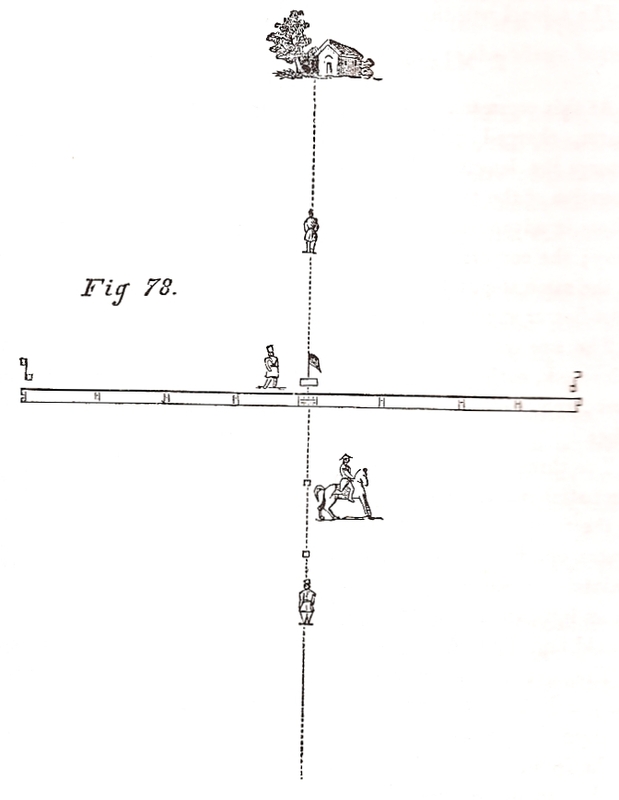 and the seventh, the necessary space for wheeling into line, he will halt his company; the guide facing to the rear will place himself promptly on the di­rection, and the moment he shall be assured in his position, the captain will align the company by the left, and then place himself two paces before its centre the other companies will successively conform themselves to what has just been prescribed for the sixth company. The colonel will follow the movement, and see that each company halts at the prescribed distance; he will promptly remedy any fault that may be committed, and, as soon as all the compa­nies shall be aligned, he will cause the guides, who are faced to the rear, to face about. The lieutenant-colonel will successively assure the left guides on the direction, placing himself in their rear, as they arrive. The major will bold himself at the head of the column, and will direct the march of the leading guide. To take distances on the head of the column. 1.On the first company, take wheeling distance. 2. Battalion, about-FACE. 3. Column, forward. 4. Guide right. 5. MARCH (or double quick-MARCH). At the command march, the captain of the designated company will align it on the marker placed by its side. The remaining companies will put them­selves in march, the guide of the rearmost one will direct himself a little within the left general guide; when the second company shall have arrived oppo­site the second marker, its captain will face it about, conforming to what is prescribed, No. 270, and align it, as has just been prescribed for the first company. The captains of the remaining companies will each, in succession, conform himself to what has just been prescribed for the captain of the sec+ond. The colonel, lieutenant-colonel and major, will l conform themselves to what is prescribed in No. 314. To change direction in a column closed in mass. To change direction in marching. 316. A column by division, closed in mass, being in march, will change direction by the front of subdivisions. Whether the change be made to the reverse, or to the pivot flank, it will always be executed on the principle of wheeling in marching; to this end, the colonel will cfause the battalion to take the guide on the flank opposite to the intended change in direction, if it be not already on that flank. 1. Battalion, right wheel, 2. MARCH. (Fig. 69) At the command march, the leading division will wheel as if it were part of a column at half distance. will, at once conform themselves to its movement; to this end the left guide of each, advancing slightly the left shoulder, and lengthening a little the step, will incline to the left, and will observe, at the same time, to gain so much ground to the front that there may be an interval of four paces between his division and that which precedes it; and as soon as he shall cover the preceding guide, he shall cease to incline, and then march exactly in his trace. Each division will conform itself to the movement of its guide; the men will fell lightly the elbow towards him and advance a little the left shoulder the instant the movement commences; each file, in inclining, will gain so much the less ground to the frouint, as the file shall be nearer to the pivot, and the right guide will gain only so much as may be necessary to maintian between his own and the preceding division the same distance which separates their marching flanks. At the second command, which will be given at the instant the leading division completes its wheel, it will continue the direct march; the other divisions will conform themsoeves to this movement; and if any guide find himself not covering his immediate leader, he will, by slight degree, bring himself on the trace of that guide, bu advancing the right shoulder. To change direction from a halt. 1.Change direction by the right flank. 2. Batta­lion, right-FACE.3. MARCH (or double quick­ MARCH). (Fig. 70) At the second command, the column will face to the right, and each chief of subdivision will place himself by the side of his right guide. 1.First company (or first division). 2. HALT. 3. FRONT.4. Left-DRESS. At the fourth command, the subdivision will place itself against the two markers, and be promptly aligned by its chief. form himself to the direction of the right guide of the subdivision preceding his own in the column, so as to enter on the new di­rection parallelly to that subdivision, and at the distance of four paces from its rear rank. Each chief of subdivision will halt in his own person, on arriving opposite to the left guides already placed on the new direction, see his sub­division file past, and conform himself, in halting and aligning it, to what is prescribed No. 309. If the change of direction be by the left flank, the colonel will cause markers to be esta­blished as before, the first in front of the left file of the leading subdivision, and then give the same commands, substituting the indication left for right. Being in column by company, closed in mass, to form divisions. At the first command, the captains of the left companies will caution them to face to the left. At the second command, the left companies will face to the left, and their captains will place themselves by the side of their respective left guides. The right companies, and their captains will stand fast; but the right and left gui4es of each of these companies will place themselves respectively before the right and left files of the com­pany both guides facing to the right, and each re his right arm gently against the breast of the front rank man of the file, in order to mark the direction. 1.Such company. 2. HALT. 3. FRONT. four paces to march; the second at the instant it shall have cleared its right company; and the third immediately after the second. The company having faced to the front, the files, if there be intervals between them, will promptly incline to the right; the captain will place himself on the left of the right company of the division, and align himself correctly on the front rank of that company. At this, the left company will dress forward on the alignment of the right company; the front rank man, who may find himself opposite to the left guide, will, without preceding his rank, rest lightlyhis breast against the right arm of this guide; the captain of the left company will direct its alignment on this man, and the alignment being assured, he will command, FRONT; but not quit his position. At this, the guides who have marked the fronts of divisions will return to their places, in column, the left guide of each right company passing through the interval in the centre of the divi­sion, the senior captain of each division will take his post two paces in front of the division, and the junior captain will place himself between the two companies. 1. Form divisions. 2. Left companies, by the left flank. 3. MARCH (or double quick-MARCH). Such company by the right flank.-MARCH. At the fifth command, the column will resume the gait at which it was marching previous to the commencement of the movement. The guides of each division will remain on the right and left of their respective companies; the left guide of the right company will pass into the line of file closers, before the two companies are united; the right guide of the left company will step into the rear rank. Being in column at full or half distance to form divisions. 1. Such company, forward. 2. Guide right. 3. MARCH. 1. Such company by the right flank. 2. MARCH. If the left be in front, the movement will be excuted by inverse means. 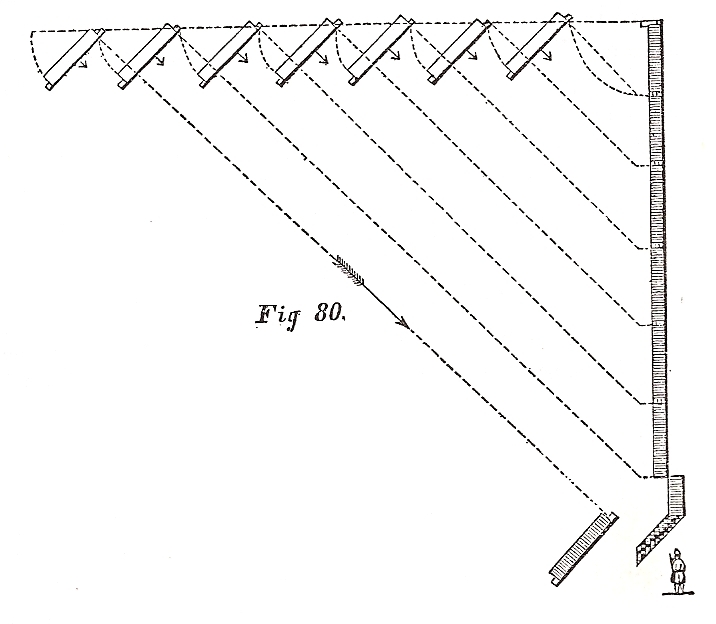 Countermarch of a column at full or half distance. L.Countermarch. 2. Battalion right (or left-FACE. 3 By file left (or right). 4. MARCH,(or double quick-MARCH). To countermarch a column closed in mass. (Fig. 71.) If the column be closed in mass, the coun­termarch will be executed by the commands and means subjoined. 1.Countermarch. 2. Battalion, right and left FACE. 3. By file left and right. 4. MARCH (or double quick-MARCH). At the first command, the chiefs of the odd numbered divisions will caution them to face to the right, and the chiefs of the others to face to the left. divisions will hasten to their right and cause two files to break to the rear, and each chief place himself on the left the leading front rank man of his division ; the chiefs of even divisions will hasten to their left, and cause two files to break to the rear, and each chief place himself on the right of his leading front rank man. At the command march, all the divisions, each conducted by its chief, will step off smartly, the guides standing fast; each odd division will wheel by file to the left around its right guide; each even division will wheel by file to the right around its left guide, each division so directing its march as to arrive behind its opposite guide, and when its head shall be up with this guide, the chief will halt the division, and cause it to face to the front. by the right; to this end, the chiefs of the even divisions will move rapidly to the right of their respective divisions. The divisions being aligned, each chief will command, FRONT; at this, the guides will shift to their proper flanks. In a column with the left in front, the countermarch will be executed by the same com­mands and means; but all the divisions will be aligned by the left: to this end, the chiefs of the odd divisions will hasten to the left of their re­spective divisions as soon as the latter shall have been faced to the front. 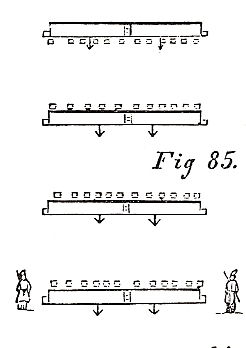 Different modes of passing from the order in column to the order in battle. Manner of determining the line of battle. 322. The line of battle may be marked or deter­mined in three different manners: lst, by placing two markers eighty or a hundred paces apart, on the direction it is wished to give to the line; 2d, by placing a marker at the point at which it may be intended to rest a flank, and then choosing a second point towards, or beyond the opposite flank, and there posting a second marker distant from each other a little less than the leading subdivi­sion; 3d, by choosing at first the points of direc­tion for the flanks, and then determining, by in­termediate points, the straight line between those selected points, both of which may sometimes be beyond reach. 1. Left into line, wheel. 2. MARCH (or double quick-MARCH). At the first command, the right guide of the leading company will hasten to place himself on the direction of the left guides of the column, face to them, and place himself so as to be oppo­site to one of the three right files of his company, when they shall be in line: he will be assured this position by the lieutenant colonel. At this command the company will dress up between the captain and the front rank man on its left, the captain directing the alignment on that man; the front rank man on the right of the right company, who finds himself opposite to its right ­guide, will lightly rest his breast against the left arm of this guide. At this command, the guides will return to their places in line of battle, each passing through the nearest captain's interval; to permit him to pass, the captain will momentarily step before the first file of his company, and the covering sergeant behind the same file. This rule is general for all formations into line of battle. When companies form line of battle, file closers will always place themselves exactly two paces from the rear rank, which will sufficiently assure their alignment. The battalion being correctly aligned, the colonel, lieutenant colonel, and major, as well as the adjutant and sergeant major, will return to their respective places in lire of battle. This rule is general for all the formations into line of battle. A column, with the left in front, will form itself to the right into line of battle, according to the same principles; the left guide of the left company will place himself, at the first command, on the direction of the right guides, in a manner corresponding to what is prescribed, No. 391, for the right guide of the right company. At the command guides posts, the captains will take their places in line of battle as well as the guides. This rule is general for all formations into line of battle in which the companies are aligned by the left. 324. 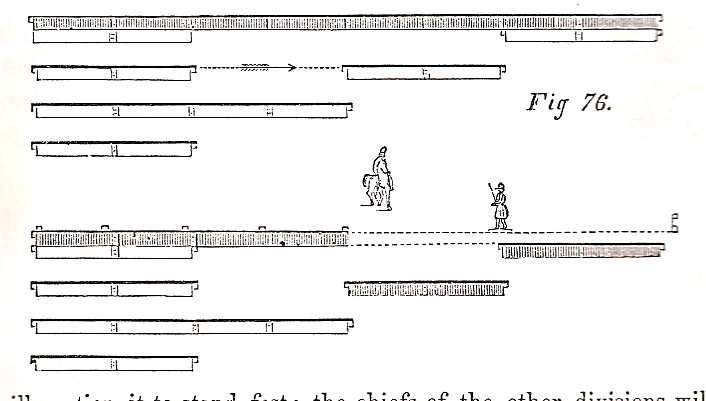 A column by division may form itself into line of battle by the same commands, and means, but observing what follows: if the right be in front, at the command halt, given by the chiefs of division, the left guide of each right company will place himself on the alignment opposite to one of the three files on the left of his company; the left de of the first company will be assured on the direction by the lieutenant colonel; the left guides of the other right companies will align themselves correctly on the division guides; to this end, the division guides (on the alignment) will invert, and hold their pieces up perpendicularly before the centre of their bodies, at the command left into line, wheel. If the column by division be with the left in front, the right guides of left companies will conform themselves to what has just been prescribed for the left guides of right companies and place themselves on the line opposite to one of the three right files of their respective companies. 325. A column in march will be formed into line, without halting, by the same commands and means. At the command march, the guides will halt in their places, and the lieutenant colonel will promptly rectify their positions. 1. By companies left wheel. 2. MARCH (or double quick-MARCH). 3.Forward. 4. MARCH. 5. Guide centre. pleted, the companies will march directly to the front. At the fifth command, the color and the general guides will move rapidly six paces to the front. The colonel will assure the direction of the color; the captains of companies and the men will, at once, conform themselves to the principles of the march in line of battle, to be indicated, No. 343. By inversion to the right (or left) into line of battle. 1. By inversion, right into line, wheel. 2. Battalion, guide right. 3. MARCH (or double quick-MARCH). At this, the right front rank man of each subdivision will face to the right, rest his breast lightly against the left arm of his guide, and thebattalion will form itself to the right into line of battle, according to the principles prescribed. 327. 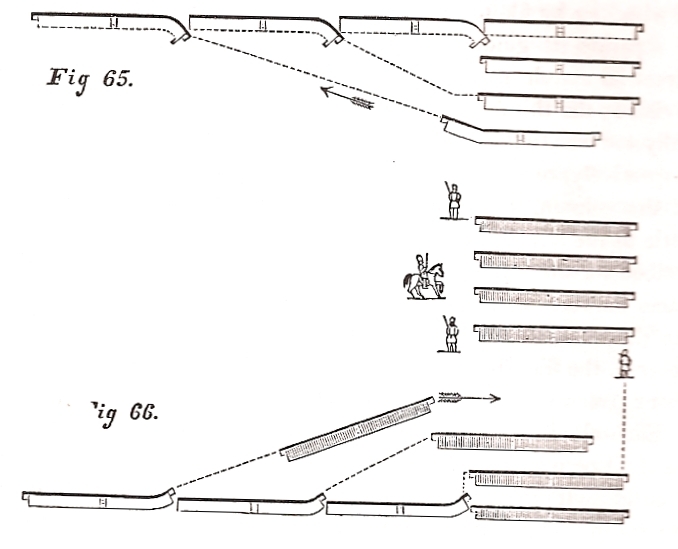 Under the denomination of successive formations are included all those formations where the several subdivisions of a column arrive one after another on the line of battle; such are formations on the right, or left, forward and faced to the rear into line of battle, as well as deploy­ments of columns in mass. The successive formations which may be ordered when the column is marching, and is to continue marching, will be executed by a combi­nation of the two gaits, quick and double quick time. In all the succesive formations, every captain will always observe before dressing his company, to place himself correctly on the line either on the left or right of the company which precedes his in line, and see that his guide has been assured on the directions by the lieutenant-colonel. Column at full distance, on the right (or on the left), into line of battle. 328. A column by company, at full distance and right in front, having to form itself on the right into line of battle, the colonel will indicate to the lieutenant colonel a little in advance, the point of appui, or rest, for the right, as well as the point of direction to the left; the lieutenant colonel will hasten with two markers, and establish them in the following mariner on the direction indicated. The first marker will be placed at the point of appui for the right front rank man of the lead­ing company; the second will indicate the point where one of the three left files of the same com­pany will rest when in line; they will be placed so as to present the right shoulder to the battalion when formed. 1. On the right, into line. 2. Battalion, guide right. At the second command, the right will be­come the directing flank, and the touch of the elbow will be to that side; the right guide of the leading company will march straight forward until up with the turning point, and each following guide will march in the trace of the one immediately preceding. 1. First company; 2. HALT. At this command, the company will align itself; the two men who find themselves opposite to the two markers, will each lightly rest his breast against the right arm of his marker; the captain, passing to the right of the front rank, will direct the alignment on these two men. These rules are general for all successive formations. The second company will continue to march straight forward; when arrived opposite to the left flank of the preceding company, it will turn to the right, and be formed on the line of battle, as his just been prescribed; the right guide will direct himself so as to come upon that line by the side of the man on the left of the first company. At the distance of three paces from the line of battle, the company will be halted by its captain, who will place himself briskly by the side of the man on the left of the preceding company, and align himself correctly on its front rank. At this command, the second company will dress forward on the line; the captain­ direct its alignment on the front rank man who has rested his breast against the left guide of the company. At this command, the guides will take their places in line of battle, and the markers placed before the right company will retire. At the command march, all the companies will take the double quick step, and the movement will be executed as prescribed, No. 417, and following. The colonel will follow up the formation, passing along the front, and being always opposite to the company about to turn it is thus that he will be the better able to see and to correct the error that would result from a command given too soon or too late to the preceding company. in order to assure, in like manner, the guide of the third company, and so on, successively, to the left of the battalion. In assuring the guides in their positions on the line of battle, be will take care to let them first place themselves, and confine himself to rectifying their positions if they do not cover accu­rately, and at the proper distance, the preceding guides or markers. This rule is general, for all successive formations. When the direction of a line of battle forms a sensible angle with that of the march of the column, the colonel, before beginning the movement, will give the head of the column a new direction parallel to that line. A column left in front, will form itself on the left into line of battle according to the same principles. Each captain willo cause his company to support arms, the instant that the captain, who follows him, shall have commanded front. This rule is general, for all successive formations. When, in the execution of this movement, the colonel shall wish to commence firing, he will give the order to that effect to the captain whose company is first on the line; this captain will immediately place himself behind the centre of his company, and as soon as the next captain shall have commanded front, he will commence the fire by file. At the command fire by file, the marker at the outer flank of this company will retire, and the other will place himself aginst the nearest man of the next company. The captain of the latter will commence firing as soon as the captain of the third company, in line, shall have commanded front; the marker before the right or left file retiring, and the guide before the opposite flank taking post before the nearest file of the third company, in line; and so on to the last company. Column at fall distance forward into line of battle. 1.Forward into line. 2. By company, left half wheel. 3. MARCH (or double quick-MARCH). (Fig. 73.) At the first command, the captain of the leading company will add - guide right, put the company in march, halt it three paces from the markers, and align it against the latter by the right. 4. Forward. 5. MARCH. 6. Guide right. At the fifth command, the companies, ceasing to wheel, will march straight forward; and at the sixth, the men will touch elbows to­wards the right. The right guide of the second company, who is nearest to the line of battle, will march straight forward; each succeeding right guide will follow the file immediately before him at the cessation of the wheel. At the instant that the guide of the second company begins to turn to the right, the guide of the third, ceasing to follow the file immediately before him, will march straight forward; and, when he shall arrive opposite to the left of the second, his captain will cause the company to turn to the right, in order to approach the line of battle, halt it at three paces from that line, and align it by the right, as prescribed for the second company. Each following company will execute what has just been prescribed for the third, as the preceding company shall turn to the right, in order to approach the line of battle. The colonel and lieutenant-colonel will observe in this formation, what is prescribed for them on the right into line. A column left in front, will form itself forward into line of battle according to the same principles and by inverse means. I. Forward into line. 2. By company, left half wheel. 3. MARCH (or double quick-MARCH). At the first command, the captain of the first company will command, Guide- right, and caution it to march directly to the front, the captains of the other companies will caution them to wheel to the left. At the command march, briskly repeated by the captains, the movement will be executed as in the last case. If the colonel should wish to form the column forward into line, and to continue to march in this order, he will not cause markers to be established; the movements will be executed in double quick time, by he same commands and means, observing what follows. At the first command, the captain of the first company will add quick time after the com­mand guide right. At the second command, the first company will continue to march in quick time, and will take the touch of elbows to the right; its chief will immediately place himself on its right, and to assure the march, will take points of direction to the front. The captain of the second company will cause his company to take the same gait as on soon as it shall arrive a line with the first, and will also move to the right of his company; the captains of the third and fourth companies will execute successively what has just been prescribed for the second. The companies will preserve the touch of elbows to the right, until the command, guide centre. and the left general guide, as they arrive on the line, will also conform to the same principles If the column be marching in double quick time, when the last company shall have arrived in line, will also conform to the same pronciples. Column at full distance, faced to the rear, into line of battle. 1.Into line, faced to the rear. 2. Battalion, right -FACE. 3. MARCH (or double quick-MARCH). At the first command, the captain of the leading company will cause it to face to the right, and put it in march, causing it to wheel by file to the left, and direct its march towards the line of battle which it will pass in rear of the left marker; the first file having passed three paces beyond the line, the company will wheel again by file to the left, in order to place itself in rear of the two markers; being in this position, its cap­tain will halt it, face it to the front, and align it by the right against the markers. At the second command, all the other companies will face to the right, each captain placing himself by the side of his right guide. At the command march, the companies will put themselves in movement; the left guide of the second, who is nearest to the line of battle, will hasten in advance to mark that line; he will place himself on it as prescribed above for succes­sive formations, and thus indicate to his captain the point at which he ought to pass the line of bat­tle, by three paces, in order to wheel by file to the left, and then to direct his company parallelly to that line. 1.Second company. 2. HALT. 3. FRONT. 4.Right-DRESS. The first command will be given when the company shall yet have four paces to take to reach the halting point. At the second command, the company will halt. At the third, the company will face to the front, and if there be openings between the files, the latter will promptly close to the right; the captain will immediately place himself by the side of the man on the left of the preceding company, and align himself on its front rank. The fourth command will be executed as prescribed, No. 328.
twelve or fifteen paces, and each place himself so as to be opposite to one of the three left files of his company, when in line. If the movement be executed in double quick time, the moment it is commenced, all the left guides will detach themselves at the same time from the column, and will move at a run, to esta­blish themselves on the line of battle. The colonel and lieutenant-colonel, in this formation, will each observe what is prescribed for him in that of on the right, into line of battle. A column, left in front, will form itself faced to the rear into line of battle according to the same principles and by inverse means. At the first command, the captains will caution their companies to face by the right flank. At the command march, briskly repeated by the captains of companies, all the companies will face to the right, and the movement will be completed as in the last case. Formation in line of battle by two movements. 1. Left into line, wheel. 2. Three rear companies, forward into line. 1. Forward. 2. MARCH. 3. Guide right. 1. To the left and forward into line. 2. MARCH (or double quick-MARCH). 1.By company to the and forward into line. 2. MARCH. 3 .Forward. 4. MARCH. 5. Guide centre. If the battalion be marching in double quick time, the colonel will cause quick time to be taken before commencing the movement. 1.Left into line, wheel. 2. Three rear companies into line, faced to the rear. 1. Such company; 2. Right-FACE. At this command, briskly repeated, the first five companies will form themselves to the left, into line of battle, and the three last faced to the rear, into line of battle, by the means prescribed for these respective formations. 1.To the left and into line, faced to the rear. 2. MARCH (or double quick-MARCH). Different modes of passing from column at half distance, into line of battle. Column at half distance, to the left (or right) into line of battle. 335. A column at half distance having to form itself to the left (or right) into line of battle, the colonel will cause it to take distances by one of the means prescribed, No. 313; which being executed, he will form the column into line to the left or right, No. 323. 1. By the rear of column left (or right) into line, wheel. 2. MARCH (or double quick-MARCH). the left guide will halt, and facing to the rear, will place himself on the line; the company will wheel to the left, the man on the left of the front rank will face to the left, and place his breast against the arm of the guide; the captain will halt the company when its right shall arrive near the line, and will align it by the left. The other companies will conform successively to what has just seen prescribed for the seventh. Each captain will direct the alignment of his company on the left man in the front rank of the company next on his right. The lieutenant-colonel will see that the leading guide marches accurately on the prolongation of the line of battle, and directs him­self on the right general guide. The major, placed in rear of the left guide of the eighth company, will, as soon as the guide of the seventh company is established on the direction, hasten in rear of the guides of the other companies, so as to assure each of them on the line in succession. Column at half distance, on the right (or left) into line of battle. 336. A column at half distance will form itself on the right (or left) into line of battle, as pre­scribed for a column at full distance. Column at half distance, forward, into line of battle. 337. If it be wished to form a column at half distance, forward into line of battle, the colonel will first cause it to close in mass and then deploy it on the leading company. Column at half distance, faced to the rear, into line of battle. 338. A column at half distance will be formed into line of battle, faced to the rear, as prescribed for a column at fall distance. Deployment of columns closed in mass. markers, and establish them on that line, the first at the point indicated, the second a little less than the front of a division from the first. Deployments will always be made upon lines parallel, and lines perpendicular to the line of battle; consequently, if the head of the column be near the line of battle, the colonel will com­mence by establishing the direction of the column perpendicularly to that line, if it be not already so, by one of the means indicated, No. 244 and following, or No. 307 and following. If the column be in march, he will so direct it that it may arrive exactly behind the markers, perpendicularly to the line of battle, and halt it at three paces from that line. The column, right in front, being halted, it is supposed that the colonel wishes to deploy it on the first division; he will order the left general guide to go to a point on the line of battle a little beyond that at which the left of the battalion will rest when deployed, and place himself correctly an the prolongation of the markers established before the first division. 1. On the first division, deploy column. 2. Battalion, left-FACE. (Fig. 75) At the first command, the chief of the first division will caution it to stand fast; the chiefs of the three other divisions will remind them that they will have to face to the left. At the second command, the three last divisions will face to the left; the chief of each division will place himself by the side of its left guide, and the junior captain by the side of the covering sergeant of the left company who will have stepped into the front rank. At the same command, the lieutenant-colonel will place a third marker on the alignment of the two first, opposite to one of the three left files of the right company, first division, and then place himself on the line of battle a few paces beyond the point at which the left of the second division will rest. the line of battle; the left guides of the third and fourth divisions will march abreast with the guide of the second; the guides of the third and fourth, each preserving the prescribed distance between him­self and the guide of the division which preceded his own in the column. 1. Second division. 2. HALT. 3. FRONT. The first command will be given when the division shall yet have seven or eight paces to march; the second, when the right guide shall be abreast with the chief of the division, and the third immediately after the second. At the second command, the division will halt; at the third, it will face to the front, and if there be openings between the files, the chief of the division will cause them to be promptly closed to the right; the left guides of both companies will step upon the line of battle, face to the right, and place themselves on the direction of the markers established before the first division, each guide opposite to one of the three left files of his company. At this, the division will be aligned by the right in the manner indicated for the first. 1.Third division. 2. HALT. 3. FRONT. 1.Third division, forward. 2. Guide right.MARCH. At the third command, the division will march towards the line of battle; the right guide will so direct himself as to arrive by the side of the man on the left of the second division, and when the division is at three paces from the line of battle, its chief will halt it, and align it by the right. The chief of the fourth division will conform himself (and the chief of the fifth, if there be a fifth) to what has just been prescribed for the third. At this command, the guides will resume their places in line of battle, and the markers will retire. 1.On the first division, deploy column. 2. Batta­lion by the left flank. 3. MARCH (or double quick- MARCH). At the first command, the chief of the first division will caution it to halt, and will com­mand, First division; the other chiefs will caution their divisions to face by the left flank. Such division, by the right flank-MARCH. quick time and touch elbows to the right; the captains will place themselves on the right of their respective companies; the captain on the right of the battalion will take points on the ground to assure the direction of the march. The chief of the second division will allow his di­vision to file past him, and when he sees its right abreast of him, he will command, 1. Second divi­sion by the right flank. 2. MARCH. 3. Guide right, and when this division shall arrive on the alignment of the first, he will cause it to march in quick time. The third and fourth divisions will deploy according to the same principles as the second. The colonel, lieutenant-colonel, major, and color-bearer will conform themselves to what is prescribed No. 330. 1. On the fourth (or such) division, deploy column. 2. Battalion, right-FACE. will caution it to stand fast; the chiefs of the other divisions will caution them that they will have to face to the right. At the second command, the first three divisions will face to the right; and the chief of each will place himself by the side of its right guide. At the same command, the lieutenant colo­nel will place a third marker between the first two, so that this marker may be opposite to one of the three right files of the left company of the divi­sion; the lieutenant colonel will place himself on the line of battle a few paces beyond the point at which the right of the third division will rest when deployed. At this command, the three right divisions will put themselves in march, the guide of the first so directing himself as to pass three paces within the line marked by the right general guide. The chief of the third division will not follow its move­ment; be will see it file past, halt it when its left guide shall be abreast with him, and cause it to face to the front; and, if there be openings between the files, he will cause them to be promptly closed to the left. 1. Fourth division, Forward. 2. Guide left. 3. MARCH. The instant that the third division is unmasked, its chief will cause it to approach the line of battle, and halt it in the manner just prescribed for the fourth. The moment the division halts, its right guide and the covering sergeant of its left company will step on the line of battle, placing them­selves on the prolongation of the markers esta­blished in front of the fourth division; as soon as they shall be assured in their positions, the divi­sion will be aligned as has just been prescribed for the fourth. The second and first divisions which will have continued to march, will, in succession, be halted and aligned by the left, in the same manner as the third; the chiefs, of these divisions will con­form themselves to what is prescribed, No. 339. The second being near the line of battle, the command will not be given for it to move on this line but it will be dressed up to it. 1.On such division, deploy column. 2. Battalion outwards-FACE. 3. MARCH (or double quick-MARCH). of the directing one, will face to the right; the others, except the directing division, will face to the left; the others, except the directing division, will face to the left. of this division will align it by the directing flank, and then stop back into the rear, in order momentarily to give place to the chief of the next for aligning the next division. 343. The battalion being correctly aligned, and supposed to be the directing one, when the colonel shall wish to march in line of battle, he will give the lieutenant-colonel an intimation of his purpose, place himself about forty paces in rear of the color­-file, and face to the front. The lieutenant-colonel will place himself a like distance in front of the same file, and face to the colonel, who will establish him as correctly as possible, by signal of the sword, perpendicu­larly to the line of battle opposite to the color-­bearer. The colonel will next, above the heads of the lieutenant-colonel and color-bearer, take a point of direction in the field beyond, if a distinct one present itself, exactly in the prolongation of those first two points. The colonel will then move twenty paces farther to the rear, and establish two markers on the prolongation of the straight line passing through the color-bearer and the lieutenant-colo­nel; these markers will face to the rear, the first placed about twenty-five paces behind the rear rank of the battalion. and the second at the same distance from the first. The color-bearer will be instructed to take, the moment the lieutenant-colonel shall be established on the perpendicular, two points on the ground in the straight line which, drawn from himself, would pass between the heels of that officer; the first of these points will be taken at fifteen or twenty paces from the color-bearer. right, opposite to the captain of the right company, the other opposite to the sergeant who closes the left of the bat­talion. rank, to the left of their respective companies; the sergeant on the left of the battalion will step back into the rear rank. The covering sergeant of the company next on the left of the color-company, will step into the front rank. between himself and the corporal of the color-file, now in the front rank, will go to the position which will be hereinafter indicated, No. 602. The major will place himself six or eight paces on either flank of the color-rank. At this command, the battalion will step off with life; the color-bearer, charged with the step and direction, will scrupulously observe the length and cadence of the pace, marching on the prolongation of the two points previously taken, and succes­sively taking others in advance by the means indi­cated in the school of the company; the corporal on his right, and the one on his left, will march in the same step, taking care not to turn the head or shoulders, the color-bearer supporting the color-lance against the hip. The two general guides will march in the same step with the color-rank, each maintaining himself abreast, or nearly so, with that rank, and neither occupying himself with the movement of the other. The three corporals of the color-guard, now in the front rank of the battalion, will march well aligned, elbow to elbow, heads direct to the front, and without deranging the line of their shoulders; the centre one will follow exactly in the trace of the color-bearer, and maintaining the same step, without lengthening or shortening it, except on an intimation from the colonel or lieutenant-colonel, although he should find himself more or less than six paces from the color-rank. The covering sergeant in the front rank between the color-company and the next on the left, will march elbow to elbow, and on the same line, with the three corporals in the centre, his head well to the front. front, only occasionally casting an eye on the three centre corporals, with the slightest possible turn of the neck, and if they perceive themselves in advance, or in rear of these corporals, the cap­tain, or two captains, will almost insensibly shorten or lengthen the step, so as, at the end of several paces, to regain the true alignment, without giving sudden checks or impulsions to the wings beyond them respectively. The lieutenant-colonel, placed twelve or fifteen paces on the right of the captain of the color-company, will maintain this captain and the next one beyond, abreast with the three centre corporals; to this end, he will caution either to lengthen or to shorten the step as may be neces­sary, which the captain, or two captains, will execute as has just been explained. All the other captains will maintain them­selves on the prolongation of this basis; and, to this end, they will cast their eyes towards the centre, taking care to turn the neck but slightly, and not to derange the direction of their shoulders. The captains will observe the march of their companies, and prevent the men from getting in advance of the line of captains; they will not lengthen or shorten step except when evidently necessary; because, to correct, with too scrupulous attention, small faults, is apt to cause the production of greater-loss of calmness, silence equality of step, each of which it is so important to maintain. The men will constantly keep their heads well directed to the front, feel lightly the elbow towards the centre, resist pressure coming from the flank, give the greatest attention to the squareness of shoulders, and hold themselves always very slightly behind the line of the captains, in order never to shut out from the view of the latter the basis of alignment; they will, from time to time, cast an eye on the color-rank, or on the general guide of the wing, in order to march constantly in the same step with those advanced persons. marker (d) will quit his place and go a like distance in rear of (i); the marker (h) in his turn, do the like in respect to (d), and so on, in succession, as long as the battalion continues to advance; each marker, on shifting position, taking care to face to the rear, and to cover accurately the two markers already established on the direction. A staff officer, or the quartermaster sergeant, designated for the purpose, and who will hold him­self constantly fifteen or twenty paces facing the marker farthest from the battalion, will caution each marker when to shift place, and assure him on the direction behind the other two. To halt the battalion, marching in line of battle, and to align it. At this command, the color-rank and ge­neral guides will retake their places in line of battle, the captains in the left wing will shift to the right of their companies. The captains will immediately cast an eye towards the centre, align themselves accurately on the basis of the alignment, which the lieutenant colonel will see well directed, and then promptly dress their respective companies. The lieutenant-colonel will admonish such captains as may not be accurately on the alignment by the command- Captain of (such) company, or captains of (such) companies, move up or fall back. But when the colonel shall wish to give the battalion a general alignment, either parallel or oblique, instead of rectifying it as above, he will move some paces outside of one of the general guides (the right will here be supposed) and cau­tion the right general guide and the color-bearer to face him, and then establish them by signal of the sword, on the direction which be may wish to give to the battalion. As soon as they shall be cor­rectly established, the left general guide will place himself on their direction, and be assured in his position by the major. The color-bearer will carry the color-lance perpendicularly between his eyes, and the two corporals of his rank will return to their places in the front rank the moment he shall face to the colonel. 1. Guides- ON THE LINE. At this command, the right guide of each company in the right wing, and the left guide of each company in the left, will each place himself on the direction of the color-bearer and the two general guides, face to the color-bearer, place himself in rear of the guide who is next before him at a distance equal to the front of his company, and align himself upon the color-bearer and the general guide beyond. The captains in the right wing will shift to the left of their companies, except the captain of the color-company, who will remain on its right, but step into the rear rank; the captains in the left wing will shift to the right of their companies. At this command, the companies will move up in quick time against the guides, where, having arrived, each captain will align his company according to prescribed principles, the lieutenant-colonel aligning the color-company. If the alignment be oblique, the captains will take care to conform their companies to it in conducting them towards the line. At this command, the color-bearer, the general and company guides, and the captains in the right wing, will take their places in the line of battle, and the color-bearer will replace the heel of the color-lance against the right hip. To march in retreat, in line of battle. 1. Face to the rear. 2. Battalion, about-FACE. At the second command, the battalion will face about: the color-rank, and the general guides, if in advance, will take their places in line; the color-bearer will pass into the rear rank, now leading; the corporal of his file will step behind the corporal next on his own right, to let the color-bearer pass, and then step into the front rank, now rear, to re-form the color-file ; the colonel will place himself behind the front rank, become the rear; the lieutenant-colonel and major will place themselves before the rear rank, now leading. The colonel will take post forty paces behind the color-file, in order to assure the lieu­tenant- colonel on the perpendicular, who will place himself at a like distance in front, as pre­scribed for the advance in line of battle. If the battalion be the one charged with the direction, the colonel will establish markers in the manner indicated, No. 343, except that they face to the battalion, and that the first will be placed twenty-five paces from the lieutenant-colo­nel. If the markers be already established, the officer charged with replacing them in succession will cause them to face about, the moment that the battalion executes this movement, and then the marker nearest to the battalion will hasten to the rear of the two others. At this command, the color-bearer will ad­vance six paces beyond the rank of file-closers, accompanied by the two corporals of his guard of that rank, the centre corporal stepping back to let the color-bearer pass; the two file-closers nearest this centre corporal will unite on him behind the color-guard to serve as a basis of alignment for the line of file-closers; the two general guides will place themselves abreast with the color-rank, the covering sergeants will place themselves in the line of file-closers, and the captains in the rear rank, now leading; the captains in the left wing, now right, will, if not already there, shift to the left of their companies, now become the right. 4. MARCH (or double quick-MARCH). The battalion will march in retreat on the same principles which govern the advance in line. To halt the battalion marching in retreat, and to face it to the front. 1. Face to the front. 2. Battalion, about-FACE. At the second command, the color-rank, general guides, captains, and covering sergeants, will all retake their habitual places in line of battle, and the color-bearer will repass into the front rank. 1. Battalion, right about. 2. MARCH. At the command march, the battalion will face to the rear and move off at the same gait by the rear rank. If the colonel should wish the battalion to march again by the front, he will give the same commands. Passage of obstacles, advancing and retreating. At this command, the captain of the third company will place himself in its front, turn to it, and command, 1. Third company, by the left flank, to the rear into column. 2. Double quick. 3. MARCH. He will then hasten to the left of his company. At the command march, the company will face to the left in marching; the two left file's will promptly disengage to the rear in double quick time; the left guide, placing himself at the head of the front rank, will conduct it behind the fourth company, directing himself parallelly with this company; the captain of the third will himself halt opposite to the captain of the fourth, and see his company file past; when its right file shall be nearly up with him, be will command, 1. Third company. 2. By the right flank. 3. MARCH. 4. Guide right, and place himself before the centre of his company. This company will thus follow in column that behind which if finds itself, and at wheeling distance, its right guide marching exactly in the trace of the captain of that company. of the fourth the space necessary for the return into line of the third. Third company, forward, into line. 1. By company, right half wheel. 2. Double quick.3. MARCH. 1. Forward. 2. MARCH. 3. Guide left. The second command will be given when the company shall have sufficiently wheeled. At the command march, the company will direct itself straight forward towards the line of battle, and retake its position in it according to the principles prescribed for the formation forward into line. 1.Three right companies, obstacle. 2. By the left flank, to the rear, into column.3. Double quick­-MARCH. At the first command, the captains of the designated companies will each place himself be­fore the centre of his company, and caution it as to the movement about to be executed. At the command march, the designated companies will face to the left in marching, and immediately take the double-quick step; each captain will cause the head of his company to disengage itself to the rear, and the left guide will place himself at the head of the front rank; the captain of the third company will conform to what has been prescribed for him in the last number; the captains of the other companies will conduct their companies by the flank in rear of the third, inclining towards the head of the column; and, as the head of each company arrives opposite to the right of the one next before it in column, its captain will halt, see his company file past him, face it by the right flannk, take guide right, and place himself before its centre. 1.Three right companies, forward, into line. At this, briskly repeated by the captains of the three companies, each company will execute the movement on the principles laid down in the movement of forward into line without halting. If the companies belonged to the left wing, they will execute the passage of an obstacle according to the same principles but by inverse means. When flank companies are broken off to pass an obstacle, the general guide on that flank will place himself six paces in front of the outer file of the nearest company to him remaining in line. If the battalion is marching in double quick time, and it becomes necessary to break off several companies in the passage of an obstacle, the colonel will first order the battalion to march in quick time. 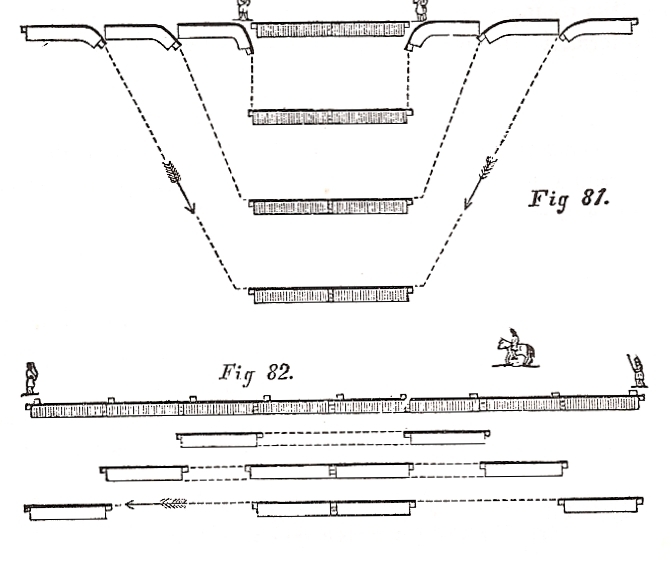 When the color-company shall be obliged to execute the movement of passing an obstacle, the color-rank will return into line at the moment the company shall face to the left or right; the major will place himself six paces before the ex­tremity of the company behind which the color­-company marches in column, in order to give the step and the direction; he, himself, first taking the step from the battalion. To pass a defile, in retreat, by the right or left flank. 351. When a battalion, retiring in line, shall encounter a defile which it must pass, the colonel will halt the battalion, and face it to the front. To the rear, by the right flank, pass the defile. 1.First company, right-FACE. 2. MARCH (or double quick-MARCH). At the command march, the first company will commence the movement; the first file will wheel to the right, march to the rear till it shall have passed four paces beyond the file closers, when it will wheel again to the right, and then direct itself straight forward towards the left flank. All the other files of this company will come to wheel in succession at the same place where the first had wheeled. The second company will execute, in its turn, the same movement, by the commands of its captain, who will give the command march, so that the first file of his company may immediately follow the last of the first, without constraint, how­ever, as to taking the step of the first; the first file of the second company will wheel to the right, on its ground; all the other files of this company will come in succession to wheel at the same place. The following companies will execute, each in its turn, what has just been prescribed for the second. When the whole of the second company shall be on the same direction with the first, the captain of the first will cause it to form, by pla­toon, into line, and the moment that it is in column, the guide of the first platoon will direct himself on the marker around whom be has to change direction in order to enter the defile. The second company will continue to march by the flank, directing itself parallelly with the line; and it, in its turn, will form by pl­atoon into line, when the third company shall be wholly on the same direction with itself. The following companies will execute in succession what has just been prescribed for the second. The first platoon of the leading company having arrived opposite to the marker placed at the entrance of the defile, will turn to the left, and the following platoons will all execute this movement at the same point. As the last companies will not be able to form platoons before reaching the defile, they will so direct themselves, in entering it, as to leave room to the left for this movement. The battalion will thus pass the defile by platoon; and, as the two platoons of each company shall clear it, companies will be formed. The head of the column having cleared the defile, and having reached the distance at which the colonel wishes to re-form line faced to the de­file, he may cause the leading company to turn to the left, to prolong the column in that direction, and then form it to the left into line of battle; or he may halt the column, and form it into line of battle faced to the rear. If the defile be in the rear of the right flank, it will be passed by the left; the movement will be executed according to the same principles, and by inverse means. If the defile be too narrow to receive the front of a platoon, it will be passed by the flank. 1.Battalion. 2. Right1 (or left)-FACE. 3. Forward. 4. MARCH (or double quick-MARCH). At the second command the captains and covering sergeants will place themselves as prescribed in the school of the company. The sergeant on the left of the battalion will place himself to the left and by the side of the last file of his company, covering the captains in file. The battalion having to face by the left flank, the captains, at the second command, will shift rapidly to the left of their companies, and each place himself by the side of the covering ser­geant of the company preceding his own, except the captain of the left company, who will place himself by the side of the sergeant on the left of the battalion. The covering sergeant of the right company will place himself by the right side of the front rank man of the rearmost file of his company, covering the captains in file. and to direct himself straight forward; to this end, he will take points on the ground. Whether the battalion march by the right or left flank, the lieutenant-colonel will place him­self abreast with the leading file, and the major abreast with the color-file, both on the one side of the front rank, and about six paces from it. The adjutant, placed between the lieutenant-colonel and the front rank, will march in the same step with the head of the battalion, and the sergeant major, placed between the major and the color-bearer, will march in the same step with the adjutant. The captains and file closers will carefully see that the files neither open out, nor close too much, and that they regain insensibly their dis­tances, if lost. 1.By file right (or left). 2. MARCH. The files will wheel in succession, and all at the place where the first had wheeled, in conforming to the principles prescribed in the school of the company. 1.Battalion. 2. HALT. 3. FRONT. These commands will be executed as prescribed in the school of the company. If the battalion be marching by the flank and the colonel should wish to cause it to march in line, either to the front or to the rear, the movements will be executed by the commands and means prescribed in the school of the company. To form the battalion on the right or left, by file, into line of battle. 354. The battalion marching by the right flank when the colonel shall wish to form it on the right by file, he will determine the line of battle, and the lieutenant colonel will place two markers on that line, in conformity with what is prescribed, No. 327. 1.On the right, by file, into line. 2. MARCH (or double quick-MARCH). At the command march, the leading company will form itself on the right, by file, into lineof battle, as indicated in the school of the company­, No. 240; the front rank man of the first file will rest his breast lightly against the right arm of the first marker; the other companies will follow the movement of the leading company; each captain will place himself on the line at the same time with the front rank man of his first file, and on the right of this man. The left guide of each company, except the leading one, will place himself on the direction of the markers, and opposite to the left file of his company, at the instant that the front rank man of this file arrives on the line. The colonel will superintend the successive formation of the battalion, moving along the front of the line of battle. The lieutenant-colonel will, in succession, assure the direction of the guides, and see that the men of the front rank, in placing themselves on the line, do not pass it. Change of front perpendicularly forward. 355. The battalion being in line of battle, it is supposed to be the wish of the colonel to cause a change of front forward on the right company, and that the angle formed by the old and new positions be a right angle, or a few degrees more or less than one; he will cause two markers to be placed on the new direction, before the position to be occupied by that company, and order its captain to establish it against the markers. 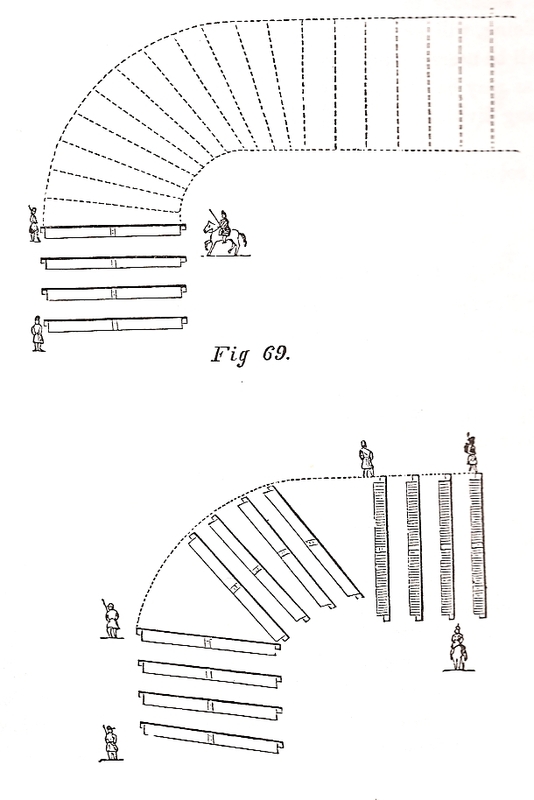 the markers by a wheel to the right on the fixed pivot; and after having halted it, he will align it by the right. (Fig. 79.) At the second command, each captain will place himself before the centre of his company. At the fifth command, the companies ceasing to wheel will march straight forward; at the sixth, the men will touch elbows towards the right. The right guide of the second company will march straight forward until this company shall arrive at the point where it should turn to the right; each succeeding right guide will follow the fire immediately before him at the cessation of the wheel, and will march in the trace of this file until this company shall turn to the right to move the line; this guide will then march straight forward. 1. Second company. 2. HALT. At the second command, the company will halt; the files not yet in line with the guide will come into it promptly, the left guide will place himself on the line of battle, and as soon as he is assured in the direction by the lieutenant-colonel, the captain will align the-company by the right. Each following company will conform to what has just been prescribed for the second. 1.Change front forward on first company. 2. By company, right half wheel. 3.MARCH (or double quick-MARCH). pany will command:1. Right turn; 2. Quick time; the captains of the other companies will caution them to wheel to the right. At the command march, the first company will turn to the right according to the principles prescribed in the school of the soldier, its captain will halt it at three paces from the markers, and the files in rear will promptly come into line. The captain will align the company by the right. The colonel will cause the battalion to change front forward on the eighth company according to the same principles and by inverse means. Change of front perpendicularly to the rear. 357. The colonel, wishing to change front to the rear on the right company, will impart his purpose to the captain of this company. 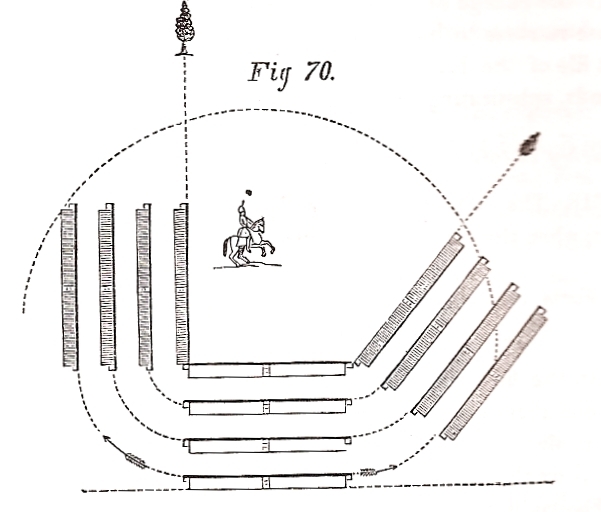 The latter will immediately face his company about, wheel it to the left on the fixed pivot, and halt it when it shall be in the direction indicated to him by the colonel; the captain will then face his company to the front, and align it by the right against the two markers, whom the colonel will cause to be established before the right and left files. 1. Change front to the rear, on first company. 2. Battalion, about-FACE. 3. By company, left half wheel. 4. MARCH (or double quick­-MARCH). (Fig. 80.) At the second command, all the companies, except the right, will face about. At the third, the captains, whose companies have faced about, will each place himself behind the centre of his company, two paces from the front rank, now the rear. 5. Forward. 6. MARCH. 7. Guide left. At the sixth command, the companies will cease to wheel, march straight forward towards the new line of battle, and, at the seventh, take the touch of the elbow towards the left. The second company, from the right, having arrived opposite to the left of the first, will turn to the left; the guide will so direct himself as to arrive parallelly with the line of battle, cross that line, and when the front rank, now in the rear, shall be three paces beyond it, the captain will command: 1. Second company; 2. HALT. the captain will cause the company to face about, and then align it by the right. All the other companies will execute what has just been prescribed for the second, each as it successively arrives opposite to the left of the company that precedes it on the new line of battle. The colonel will cause a change of front on the left company of the battalion to the rear, according to the same principles and by inverse means. To ploy the battalion into column doubled on the centre. 358. This movement consists in ploying the cor­responding companies of the right and left wings into column at company distance, or closed in mass, in rear of the two centre companies. (Fig. 81,) At the first command, the captains will place themselves two paces in front their respective companies; the captains of the two centre companies will caution them to stand fast, and the other captains will caution their companies to face to the left and right, respectively. The covering sergeants will step into the front rank. At the second command, the fourth and fifth companies will stand fast; the others of the right wing will face to the left, and the others of the left wing will face to the right; each captain whose company has faced, will hasten to break to the rear the two files at the head of his company; the left guide of each right company, and the right guide of each left company, will each place him­self at the head of its front rank, and the captain by the side of his guide. the interval between the two companies, and the left guide of the left company will place himself in the front rank on the left of the division, as soon as be shall be able to pass. All the other companies, conducted by their captains, will step off with life to arrange them­selves in column at company distance, each com­pany behind the preceding one in the column of the same wing, so that, in the right wing, the third may be next behind the fourth, the second next to the third, and so on to the right company and, in the left wing, the sixth may be next behind the fifth, the seventh next to the sixth, and so on to the left company of the battalion. nies will pass into the line of file closers, and each captain will command: 1. Such company; 2. Halt; 3. FRONT. At the second command, which will be given at the instant of union, each company will halt; at the third, it will face to the front. The senior captain in each division will place himself on its right, and command, Right-DRESS, and the junior captain will place himself in the interval between the two companies. The division being aligned, its chief will command FRONT, and take his position two paces before its centre. The column being thus formed, the divi­sions will take the respective denominations of first, second, third, &c., according to position in the column, beginning at the front. The lieutenant-colonel, who, at the second command given by the colonel, will have placed himself at a little more than company distance in rear of the right guide of the first division, will assure the right guides on the direction as they successively arrive, by placing himself in their rear. The music will pass to the rear of the column. 1.Double column at half distance. 2. Battalion by the right and left flanks. 3. MARCH (or double quick -MARCH). At the first command, each captain will move briskly in front of the centre of his company; the captains of the fourth and fifth will caution their companies to march straight forward; the other captains will caution their companies to face to the right and left. and the three left companies will face to the right. Each captain will break to the rear two files at the bead of his company; the left guides of the right companies, and the right guides of the left companies, will each place himself at the bead of the front rank of his company, and the captain by the side of his guide. The third and sixth companies will enter the column and direct themselves parallelly to the first division. Each of the other companies will, in like manner, place itself behind the company of the wing to which it belongs, and will be care­ful to gain as much ground as possible towards the head of the column. The corresponding companies of each wing will unite into divisions on taking their positions in column, and each captain, the instant the head of his company arrives at the centre of the column, will command, 1. Such company by the right (or left) flank. 2. MARCH. The senior captain of the two companies will place himself in front of the of the centre of his division, and command, Guide right; the junior captain will place himself in the interval between the two companies. The two companies thus formed into a division will take the touch of elbows to the right, and when each division has gained its proper distance, its chief will cause it to march in quick time. The double column, closed in mass, will be formed according to the same principles and by the same commands, substituting the indication, closed in mass, for that of at half distance. Deployment of the double column, faced to the front. 1. Deploy column. 2. Battalion outwards-FACE 3. MARCH (or double quick-MARCH). its head, according to the principles prescribed for the deployment of columns in mass. The captains of these companies will each, at the command march, place himself on the right of his own company, and align it by the right; the cap­tain of the fourth will then place himself in the rear rank, and the covering sergeant in the rank of file closers, at the moment the captain of the third shall come to its left to align it. The deployment being ended, the colonel will command. 361. 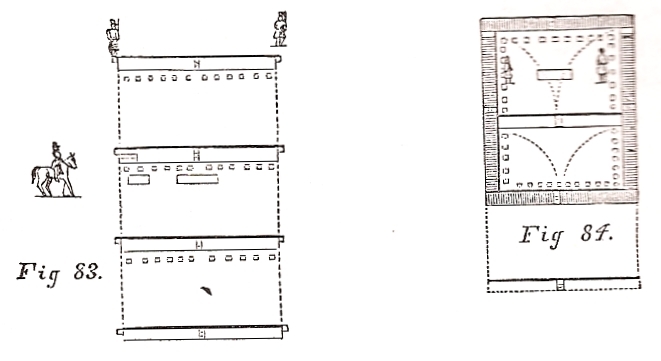 The battalion being in double column and in march, if the colonel shall wish to deploy it without halting the column, he will cause three markers to be posted on the line of battle, and when the bead of the column shall arrive near the markers, he will command: 1.Deploy column. 2. Battalion, by the right and left flanks. 3. MARCH. (or double quick-MARCH.) The column will deploy on the two leading companies, according to the principles prescribed for the deployment of a close column No. 533 and following; at the command march, the chief of the first division will halt it, and the captains of the fourth and fifth companies will align their companies by the right. 362. If the column be in march, and it be the wish of the colonel to deploy the column and to continue to march in the order of battle, he will not cause markers to be established at the head of the column. At the first command the chief of the first division will command, Quick time. At the command march, the first division will continue to march in quick time; the colonel will command, Guide centre. The captains of the fourth and fifth companies, the color, and the men will immediately conform to the principles of the march in line. The companies will take the quick step by the command of their captains as they successively arrive in line. The move­ment completed, the colonel may cause the battalion to march in double quick time. To form the double column into line of battle, faced to the right or left. 1. Right into line wheel, left companies on the right into line. 2. Battalion, guide right. 3. MARCH (or double quick-MARCH). At the first command, each captain will place himself before the centre of his company; the right companies will be cautioned that they will have to wheel to the right into line, the left companies that they will have to march straight forward. At the second command, the left guide of the fourth company will place himself briskly on the direction of the right guides of the column, face to them, and opposite to one of the three last files of his company when in line of battle; the lieutenant-colonel will assure him in that position. At the command march, briskly repeated by all the captains, the right companies will form to the right into line of battle, the left companies will put themselves in march in order to form on the right into line of battle; the lieutenant colonel will assure the guides of the left wing on the line of battle as they successively come upon it. 1. To form square. 2. To half distance, close column. 3. MARCH (or double quick-MARCH). (Fig. 83.) At the command march, the column will close to company distance, the second division taking its distance from the rear rank of the first division. 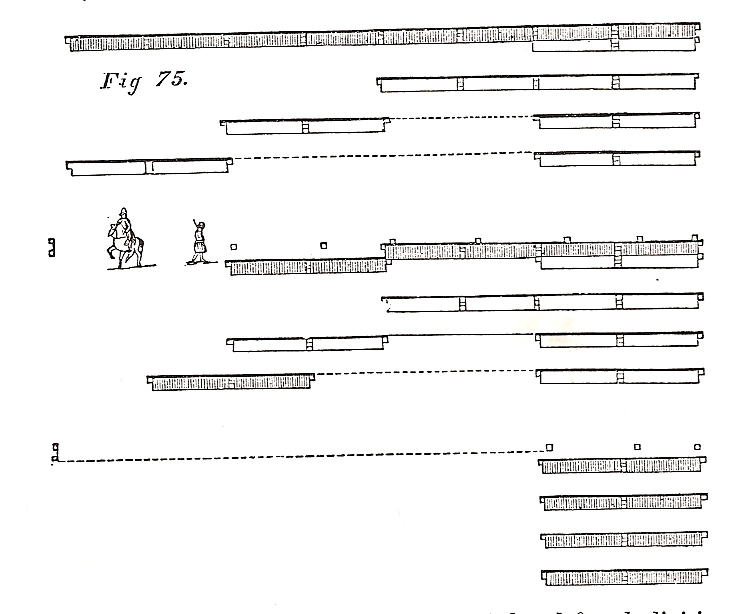 At the moment of halting the fourth divi­sion, the file closers of each company of which it is composed, passing by the outer flank of their companies will place themselves two paces before the front rank opposite to their respective places in line of battle, and face towards the head of the column. the buglers formed in two ranks will place themselves at pla­toon distance, behind the inner platoons of the second division. 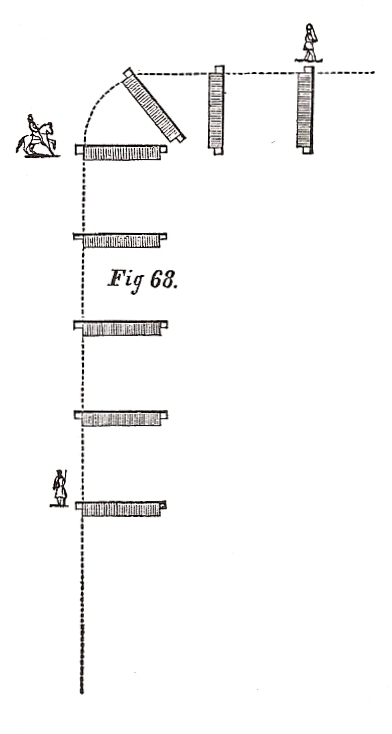 (Fig.84.) At the first command, the lieutenant-colonel, facing to the left guides, and the major, facing to those of the right, will align them from the front, on the respective guides of the fourth divi­sion, who will stand fast, holding up their pieces, inverted, perpendicularly; the right guides, in placing themselves on the direction, will take their exact distances. At the second command, the chief of the first division will caution it to stand fast; all the captains of the second and third divisions will place themselves before the centres of their respec­tive companies, and caution them that they will have to wheel, the right companies to the right, and the left companies to the left into line of battle. of his file, who is in the rear rank; the corporal of the same file who is in the rank of file closers will step into the rear rank. The chief of the fourth division will command: 1. Fourth division, forward; 2. Guide left, and place himself at the same time two paces out­side of its left flank. At this command, briskly repeated, the first division will stand fast; but its right file will face to the right, and its left file to the left. The companies of the second and third divisions will wheel to the right and left into line, and the buglers will advance a space equal to the front of a company. The fourth division will close up to form the square, and when it shall have closed, its chief will halt it, face it about, and align it by the rear rank upon the guides of the division, who will, for this purpose, remain faced to the front. The ju­nior captain will pass into the rear rank, now be­come the front, and the covering sergeant of the left company will place himself behind him in the front rank, become rear. The file closers will, at the same time, close up a pace on the front rank, and the outer file on each flank of the division will face outwards. At this command, the chiefs of the first and fourth divisions, as well as the guides, will enter the square. The captains whose companies have formed to the right into line, will remain on the left of their companies; the left guide of each of those companies will, in the rear rank, cover his captain, and the covering sergeant of each will place, himself as a file closer behind the right file of his company. The field and staff will enter the square, the lieutenant-colonel placing himself behind the left, and the major behind the right of the first di­vision. If the battalion present ten, instead of eight companies, the fourth division will make the same movements prescribed above for the second and third divisions, and the fifth, the movements prescribed for the fourth division. The fronts of the square will be designated as follows: the first division will always be the first front; the last division, the fourth front; the right companies of the other divisions will form the second front; and the left companies of the same divisions the third front. If the battalion, before the square is formed, be in double column, the two leading companies will form the first front, the two rear companies the fourth; the other companies of the right half battalion will form the second, and those of the left half battalion the third front. The first and fourth fronts will be commanded by the chiefs of the first and fourth divisions; each of the other two by its senior captain, The commander of each front will place himself four paces behind its present rear rank, and will be replaced momentarily in the command of his company by the next in rank therein. 1.To form square. 2. By the head of column, take half distance.. The colonel will halt the column the mo­ment the third division shall have its distance, and as soon as the necessary dispoditions are made, form it into square. 1.By (such) front, forward. 2. MARCH. 1.First division, forward. 2. Guide centre. At the command march, the square will put itself in motion; the companies marching by the flank will be careful not to lose their distances. The chief of the fourth division will cause his division to keep constantly closed on the flanks of the second and third fronts. This movement will only be executed in quick time. The lieutenant-colonel will place himself in rear of the file of direction in order to regulate his march. At the second command, the square will halt; the fourth front will face about immediately, and without further command; the second and third fronts will face outwards; the captains of companies will resume their places as in square. In moving the square forward by the second, third, or fourth fronts, the same rule will be observed. 1.First division forward. 2. Guide left. By company, by file right. At the moment the second and third fronts face to the left and right, each captain will cause to break to the rear the two leading files of his company. At this command, the first front will march forward; its chief will halt it when it shall have advanced a pace equal to half its front, and align it by the left. The corresponding companies of the second and third front's will wheel by file to the left and right, and march to meet each other behind the centre of the first division, and the moment they unite, the captain of each company will halt his company and face it to the front. The division being re-formed, its chief will align it by the left. The commander of the fourth front will cause it to face about: its file closers will remain before the front rank. The column being thus re-formed, the colo­nel may put it in march by the commands and means prescribed, No. 164, and following; the right guides will preserve company distance ex­actly as the directing guides. When the colonel shall wish to re-form square, he will give the necessary commands. 1. To march in retreat. 2. Face by the rear rank. 3. Battalion about-FACE. (Fig. 85.) At the second command, the file closers of the interior divisions will place themselves, pass­ing by the outer flanks of their respective companies, behind the front rank opposite to their places in line of battle; the file closers of the other divi­sions will stand fast. At the third command, the battalion will face about; each chief of division will place him­self before its rear rank, become front, passing through the interval between its two companies the guides will step into the rear rank, now front. The column being thus disposed, the colo­nel may put it in march, or cause it to form square as if it were faced by the front rank. The square being formed, its fronts will preserve the same designations they had when faced by the front rank. The battalion being in square by the rear rank, when the colonel shall wish to march it in retreat or in advance, a distance less than thirty paces, be will conform to what is pre­scribed No. 854 and following; otherwise, he will re-form the column according to the principles pre­scribed No. 863 by marching forward the fourth front. 1.To march in advance. 2. Face by the front rank. 3. Battalion about-FACE. 1. To march in retreat. 2. Battalion right about. 3. MARCH (or double quick-MARCH). At the second command, the file closers of the second and third divisions -will place themselves rapidly before the front rank of their respective division§. At the command march, the column will face about and move off to the rear. 1.To march in advance. 2. Battalion right about. 3. MARCH (or double quick-MARCH). At the second command, the file closers of the second and third divisions will place themselves before the rear rank of their respective divisions; at the third, the column will face by the front rank. 1.Reduce square. 2. MARCH (or double quick-MARCH). This movement will be executed in the manner indicated, No. 368; but the file closers of the fourth front will place themselves behind the rear rank the moment it faces about; the field and staff, the color-bearer and buglers, will, at the same time, return to their places in column. To form square from line of battle. 1. To form square. 2. Column at half distance by division. 3. On the first (or fourth) division. 4. Battalion right (or left)-FACE. 5. MARCH (or double quick-MARCH). This movement will be executed according to the principles already prescribed. 1.To form square. 2. Double column at half distance 3. Battalion inwards-FACE. 4. MARCH (or double quick-MARCH). The chief of the leading division will halt his division at the command march. 375. If the squares formed in two ranks, accord­ing to the preceding rules, should not be deemed sufficiently strong, the colonel may cause the square to be formed in four ranks. 1. To form square in four ranks. 2. To half distance, close column. 3. MARCH (or double quick­ MARCH). At the first command, the chief of the first division will caution the right company to face to the left, and the left company to face to the right. The chiefs of the other divisions will cau­tion their divisions to move forward. At the command march, the right company of the first division will form into four ranks on its left file, and the left company into four ranks on its right file. The formation ended, the chief of this division will align it by the left. The other divisions will move forward and double their files, marching: the right company of each division will double on its left file, and the left company on its right file. The for­mation completed, each chief of division will command, Guide left. Each chief will halt his division when it shall have the distance of a com­pany front in four ranks from the preceding one, counting from its rear rank, and will align his di­vision by the left. At the instant the fourth divi­sion is halted, the file closers will move rapidly before its front rank. The colonel will form square, re -form column, and reduce square in four ranks, by the same commands and means as prescribed for a battalion in two ranks. I.In two ranks undouble files. 2. Battalion outwards-FACE. 3. MARCH. At the first command, the captains will step before the centres of their respective companies, and those on the right will caution them to face to the right, and those on the left to face to the left. At the second command, the battalion will face to the right and left. At the command march, each company will undouble its files and re-form into two ranks as indicated in the school of the company. Each captain will halt his com­pany and face it to the front. The formation completed, each chief of division will align his division by the left. 1. To form square, in four ranks. 2. Column at half distance, by division. 3. On the first (or fourth) division. 4. Battalion, right (or left)-FACE. 5. At the second command, each chief of di­vision will place himself before the centre of his division, and caution it to face to the right. At the fourth command, the right guide of the first division will remain faced to the front, the battalion will face to the right. At the command march, the first file of four men of the first division will face to the front re­maining doubled. All the other files of four men will step off together, and each in succession will close up to its proper distance on the file preceding it, and face to the front, remaining doubled. When the last file shall have closed, the chief of division will command, Left-DRESS. The other divisions will ploy into column in the same manner as with a battalion in two ranks, observing what follows: the chiefs of division, instead of allowing their divisions to file past them on entering the column, will continue to lead them, and as each division shall arrive on a line with the right guide of the first division, its chief will halt the right guide, who will immediately face to the front; the first file of four men will-also halt at the same time and face to the front, remaining doubled. The second file will close on the first, and when closed, halt, and face to the front, remaining doubled. All the other files will execute successively what has just been prescribed for the second. When the last file shall have closed, the chief of division will command, Left-DRESS. 1.To form square, in four ranks. 2. Double column, at half distance. 3. Battalion, inwards-FACE. 4. MARCH (or double quick-MARCH). At the second command, the captains of companies will place themselves before the centres of their respective companies, and caution those on the right to face to the left, and those on the left to face to the right. The captain of the fifth company will caution his covering sergeant to stand fast. At the third command, the battalion will face to the left and right; at the command march, the left file of the fourth, and the right file of the fifth company, will face to the front, remaining doubled. The fourth company will close succes­sively by file of fours on the left file, and the fifth company, in like manner, on the right file; the files will face to the front, remaining doubled. The formation completed, the chief of division will command, Right DRESS. The junior captain will place himself in the interval between the two companies. The other companies will close as pre­scribed for the double column in two ranks, ob­serving what follows: each captain will halt the leading guide of his company the moment the head of his company arrives on a line with the centre of the column. In the right companies, the left guides will step into the line of file closers, and the left file of four men will face immediately to the front, remaining doubled, and by the side of the right guide of the left company. The compa­nies will each form into four ranks, the right companies on the left file, and the left companies on the right file. The formation completed, the junior captain will place him­self between the two companies, and the senior will command, Right DRESS. 1.Column against cavalry. 2. MARCH. (Fig. 86.) At the first command, the (INSERT FIGURE 86 HERE)chief of the leading division will caution it to stand fast and pass behind the rear rank; in the interior divisions each captain will promptly designate the number of files necessary to close the interval between his company and the one in front of it. The captains of the divisions next to the one in rear, in addition to closing the interval in front, will also close up the interval which separates this division from the last; the chief of the fourth division will caution it to face about, and its file closers will pass briskly before the front rank. At the command march, the guides of each division will place themselves rapidly in the line of file closers. The first division will stand fast, the fourth will face about, the outer file of each of these divisions will then face outwards; in the other divisions the files designated for closing the intervals will form to the right and left into line, but in the division next to the rearmost one, the first files that come into line will close to the right or left until they join the rear division. The files of each company which remain in column will close on their outer files, formed into line, in order to create a vacant space in the middle of the column. If the column be in march, the column against cavalry will be formed by the same com­mands and means. At the command march, the first and fourth divisions will halt and the latter division will face about; the interior divisions will conform to what has been prescribed above. 1. Form column. 2. MARCH. and right to make room for those in line who will retake their places in column by stepping backwards, except those closing the interval between the two rear divisions, who will take their places in column by a flank movement. The fourth division will face about, the guides will resume their places. To deploy the battalion as skirmishers, and to rally this battalion. To deploy the battalion as skirmishers. 380. A battalion being in line of battle, if the colonel should wish to deploy it on the right of the sixth company, for example, holding the three right companies in reserve, he will signify his intention to the lieutenant-colonel and adjutant, nd also to the major, who woill be directed to take charge of the reserve. He will point out to the lieutenant-colonle, the direction he wishes to give to the line, as well as the pouint where he wishes the right of the sixth company to rest, and to the commander of the reserve the place he may wish it established. The lieutenant-colonel will move rapidly in front of the right of the sixth company, and the adjutant in front of the left of the same company.The commander of the reserve will dispose of it in the manner to be hereinafter designated. 1. First (or second) companies-- as skirmishers. 2. On the right of the sixth conmpany -- take intervals. 3. MARCH (or double quick--MARCH). At the second command, the captains of the fifth and sixth companies will prepare to deplay their the first (or second) platoons of their companies, the sixth on its right, the fifth on its left file. The captain of the fourth company will face it to the right, and the captains of the seventh and eighth will face their respective companies to the left. At the command march, the movement will commence, the platoons of the fifth and sixth companies will deploy forward (see No. 264); the right guide of the sixth will march on the point which will be indicated to him by the lieutenat-colonel. The company which has faced to the right, and also the companies which have faced to the left, will march straight forward. The fourth company will take an interval of 100 paces, counting from the left of the fifth, and its chief will deploy its first platoon on its left file. The seventh and eighth companies will each take an interval of 100 paces, counting them from the first file of the company which is immediately on its right; and the chiefs of these companies will afterwards deploy their first platoons on the right file. The guides who conduct the files on which the deployment is made, should be careful to direct themselves toward the outer man of the neighboring company, already deployed as skirmishers; or if the company has not finished its deployment, they will judge carefully the distance which may still be required to place all these files in line, and will then march on the point this marked out. The companies as they arrive on the line, will align themselves on those already deployed. The lieutenant-colonel and adjutant will follow the deployment, the one on the right, the other on the left; the movement concluded, they will place themselves near the colonel. The reserves of the companies will be established in echelon in the following manner. The reserve of the sixth company will be placed 150 paces in rear of the right of this company; the reserves of the the fourth and fifth companies united, opposite the centre of their line of skirmishers, and thirty paces in advance of the sixth company; the reserves of the seventh and eighth companies, also united, opposite the centre of their line of skirmishers, and thirty paces farther to the rear than the reserve of the sixth company. The major commanding the companies composing the reserve, on receiving an order from the colonel to that effect, will march these companies thirty paces to the rear, and then ploy them into column by company, at half distance; after which he will conduct the column to the point which shall have been indicated to him. line, whence his view may best embrace all the parts, in order to direct their movements. If instead of deploying forward, it be desired to deploy but the flank, the sixth and fifth companies will be moved to the front ten or twelve paces, halted and deployed by the flank, the one o the right , the other on the left file, by the means already indicated. (See No. 265.) Each of the other companies will be marched by the flank; and as soon as the last file of the company, next towards the direction, shall have taken its interval, it will be moved upon the line established by the fifth and sixth companies, halted, and deployed. In the preceding example, it has been supposed that the battalion was in order of battle; bit if in column, it would be deployed as skirmishers by the same commands, and according to the same principles. If the deploment is to made forward, the directing company, as soon as it is unmasked, will be moved ten or twelve paces in front of the head of the column, and will be then deployed on the file indicated. Each of the other companies will take its interval to the right or left, and deply as soon as it is taken. If the deployment is to made by the flank, the directing company will be moved in the same manner to the front, as soon as it has been unmasked, and will then be halted and deployed by the flank on the file indicated. Each of the other companies will be marched by the flank, and when its interval is taken, will be moved on the line, halted and deployed as soon as the company next towards the direction shall have finished its deployment. When the color-company is to be deployed as skirmishers, the color, without its guard, will be detached, and will remain with the battalion reserve. 381. The colonel may cause all the movements prescribed for a company to me executed by the battalion, and by the smae commands and the same signals. When he wishes to raolly the battalion, he will cause the rally on the battalion to be sounded, and so dispose his reserve to protect this movement. The companies deployed as skirmishers will be rallied is squares on their respective reserves (see No. 280); each reserve of two contiguous companies will form the first front of the square, throwing to the rear the sections on the flanks; the skirmishers who arrive first will complete the lateral fronts, and the last the fourth front. The officers and sergeants will superintend the rally, and as fast as the men arrive, they wilol form them into two ranks, without regard to height, and cause them to face outwards. The rally being effected, the commanders of squres will profit by any interval of time the cavalry may allow for putting them in safety, either by marching them upon the battalion reserve, or by seizing an advanced position; to this end, each of the squares will be formed into column, and march in this order; and if threatened anew, it will halt and again form square. As the companies succesively arrive near the battalion reserve, each will re-form as promptly as possinble, and, without regard to designation or number, take place in the column next in the rear of the companies already in it. The battalion reserve will also form square, it itself threatened by cavalry. In this case, the companies in marching towards it will place themselves in the section without fire (i.e.march on the angles), and thus march on the squares.